MC, Host and Speaker for over 20 years! - Welcome to SalesPartners N. CA/NV Business Coaching, Sales Training, Public Speaking, Personal Development, and Team Building. If energy, possibilities and results could be packaged in a box and distributed, Jason Everett would need miles of warehouses and three FedEx’s corporations to deliver it. Yet package it he does wherever he goes whether it is front of audiences of enthusiastic listeners or behind the doors of businesses around the region. 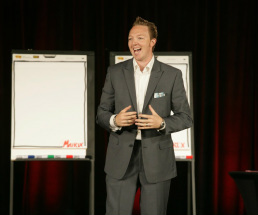 His infectious high energy, interactive, laser focused speaking style has made him an in-demand and fully booked out speaker across the region.